Upper: Dual layered mesh, internal sleeve. Outsole: Rubber developed in association with Continental, the tyre manufacturer. Weight: 326 gms/11.5 Oz for a half pair. The sixth version of Supernova Glide has been re-done from scratch, leaving little in common with past versions. The Infinergy foam (Boost) replaces most of the EVA midsole, and the resultant ride is responsive cushioning, with firmness coming from upper midsole. The upper is much more minimal, using lightweight fabrics which makes the Glide 6 almost road-racer like. The new Glide 6 has the potential to reach out to a wider range of runners, but at the same time it could alienate loyalists who were used to the plusher feel of older models. What’s in a name. A lot, in this case. Okay, the name is slightly confusing. 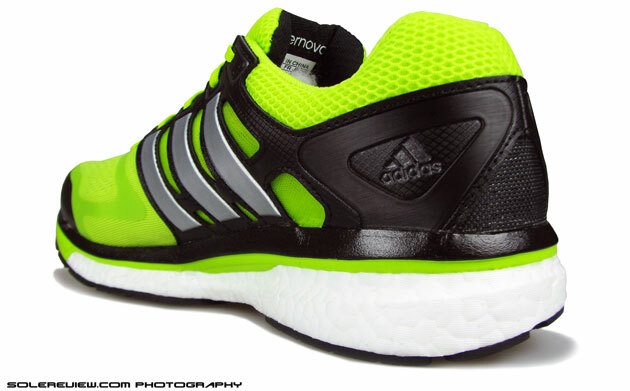 The Adidas US website calls the shoe Supernova Glide 6 Boost, while the box label says Supernova Glide 6 M. The shoe upper decides to name itself ‘Glide Boost’. Some retailers call it the Supernova Glide Boost without using the ‘6’ suffix. But for our convenience and everyone else’s, we’ll include the 6 and Boost in the name. And after this paragraph, we’ll simply refer to the shoe as SG6. Otherwise a long name eats up a lot of words, and makes a shoe review look long without actually being so. Not to mention the keystrokes. If we typed the full shoe name twenty times, that would be around 500 keystrokes and borderline carpel tunnel syndrome. Which would be a bummer, won’t it? Adidas’ shoe names aim for the stars. In case this, Supernova represents a premium line of running shoes priced north of $100. We’ll dive into the review soon, but before that, a brief explanation of the pecking order. Adistar represents the brand’s statement level products, with retail prices nudging the far side of $100-200 spectrum. 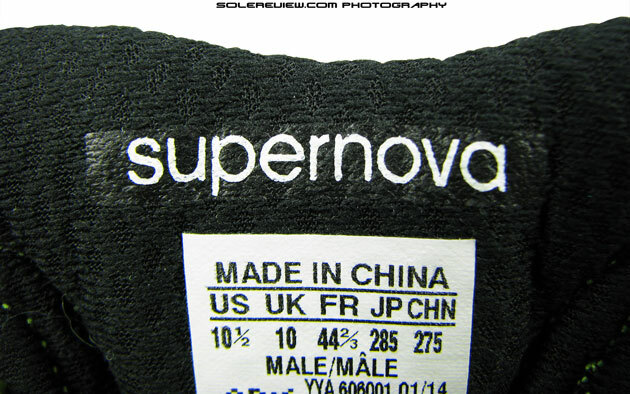 Supernova sits right below the Adistar in pricing and features, but still above the $100 priceband. Both of these line-ups offer different shoe models and categories in their repertoire, like cushioning, stability and racing. The Supernova Glide series so far have come to represent a premium level of cushioning with most of the bell and whistles from the German brand’s hoard of shoe technologies. The Glide platform has been successful for Adidas commercially the past five years, so incorporating the winning Boost platform was an expected next step in the model’s evolution. The 2012 Adidas Supernova Glide 4. Featured the shape shifting Formotion and a plush upper. Before Boost gatecrashed the party, the 2012 Supernova Glide 4 was by far the best shoe in the franchise’s pre-Boost life – so we’ll use that shoe as a reference point. The 2012 SG4 was a plush, cushioned neutral running shoe, featuring premium upper materials and the shear inducing ‘Formotion’ heel technology. Formotion is an articulated foot-pad attached to the midsole by an urethane chamber. The goal of Formotion was to improve foot transition for heel strikers while providing cushioning by isolating landing impact. This, when paired up with a well meaning up resulted in a shoe of many talents, appealing to many a runners. So far so good. The 2014 Supernova Glide 6 Boost features the recently introduced Infinergy foam. But this is 2014, and much water has flown under the bridge. Rules of engagement have changed for Adidas, and it no longer relies on familiar tricks to impress. There is a new found fervour within the walls of its headquarters in Herzogenaurch, driven by stellar success of the Boost platform. The brand is building a veritable army of shoes, each packaged with different treatments of the Boost foam. The Supernova Glide franchise is pummeled over by this tidal wave of enthused change, and undergoes a complete transformation in the process. This is by no stretch of imagination a negative thing, but for three-stripe loyalists who are used to putting miles on past versions of Supernova Glide, the finer details are worth knowing. Supernova Glide gets the Boost treatment. Lower part is Boost midsole, upper layer is EVA. Steam-molded particles of cushioned wonder. 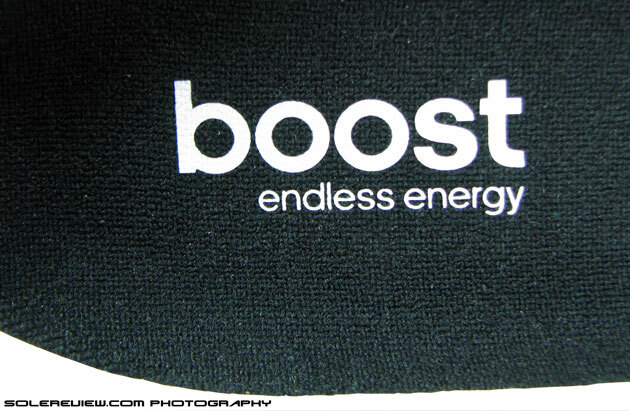 Our Energy Boost 2 review explains this in detail. The 2014 SG6 shares little with its 2012 namesake when it comes to design, materials and overall approach to construction. The Glide 6 does away with ‘Formotion’ crash pad and the soft Adiprene EVA(Ethylene Vinyl Acetate) midsole, and in its place inserts a layer of near heel-to-toe Boost foam which stops just below the toe base. But unlike the more expensive Energy Boost 2, the SG6 employs a layer of firm, injected molded EVA lining between the upper and Boost foam. This EVA liner, when combined with Boost, results in a ride sensation which hints at firmness, yet delivers a cushioning feel which is responsive. This is a marked departure from SG4 and SG5, where deep, foam-padded richness ruled supreme in lower regions of the shoe. Disappearance of the Formotion crash-pad also leads to a flatter heel strike, with none of the previously experienced shear. 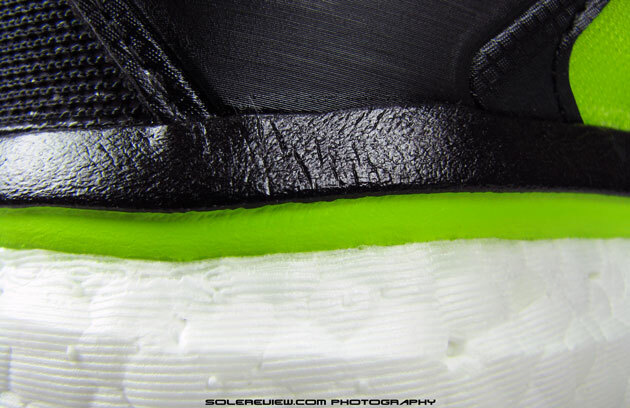 Close-up of the EVA foam layer between upper and midsole. It lends a level of firmness to the ride, muffling the Boost cushioning sensation. There’s a fabric strobel under the footbed, and the EVA foam directly below that. 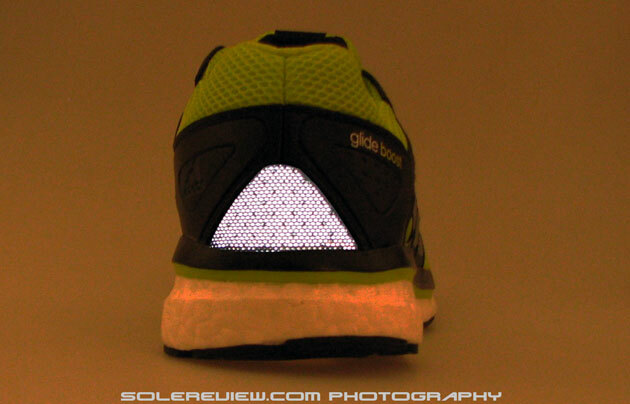 Unlike the Energy or Sonic Boost, there is no cut-out so the Boost foam sits distanced from the foot. Admittedly, the SG6 isn’t in the same league as the Energy Boost 2 when it comes to the level of cushioning. 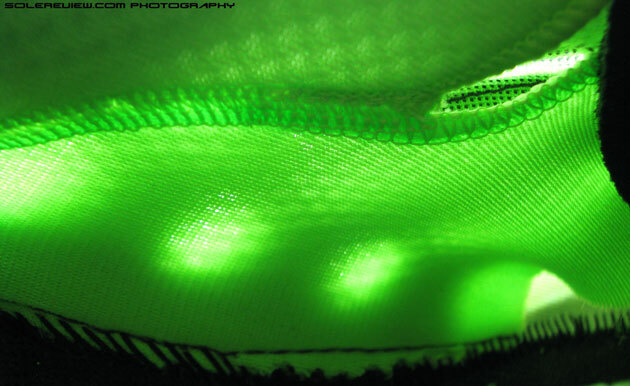 The Infinergy foam layer is thinner when compared to the Energy Boost, and is also set-up differently. There is, however, a definite sense of uniformity in underfoot padding from heel to toe, thus resulting in consistent foot-strike transition. The heel area comes across as firmer because the relatively hard EVA adds a layer of separation between the foot and Boost foam. The best way to describe the SG6 ride is that one experiences an unmissable feel of underfoot cushioning, but that is somewhat insulated by the EVA layer in the heel. There is more than enough padding, except that the experience isn’t sharp around the edges. The cushioning is delivered when it is called upon, if you know what we mean. It won’t be far from the truth if we say that the SG6 has a duality of character and purpose, which is discovered once you throw some variations in running pace. At slow speeds, the shoe won’t feel as cushy as the Energy Boost or the Supernova Glide 4/5. But crank up speed on these runners, and you’ll be rewarded with feedback from the Boost midsole. Boost peeks through two rectangular cut-outs in the forefoot area. The outcome is greater cushioning feel and feedback. along with flexibility. The forefoot feels more cushioned than the rear, as Boost foam exposes itself through two rectangular cut-outs. 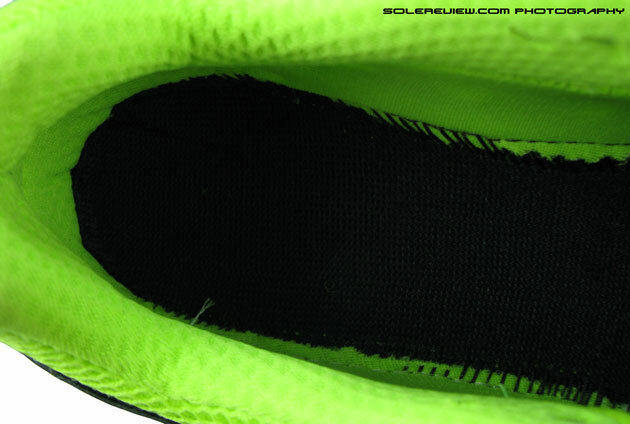 A natural consequence of that design element is spongy feel and better ground feedback under the forefoot area. Use of lesser material also makes the forefoot easier to bend, and outsole grooves further help increase flexibility. These properties make the SG6 adapt well to forefoot strike patterns, and the heel cushioning will agree with most rear-foot or heel strikers. Same 6 mm thick Foot-bed carries over from the Supernova Glide 4 and 5. The drop-in, 6 mm footbed is exactly identical to the one used for a few years now, with the only change being the printed text on its cloth lining. The last marking (21045) is the same as previous Glides so it is safe to assume that the upper fit and heel-to-toe drop remains unchanged. Adidas has not published heel drop in SG6’s specs but it should be between 10-12 mm, typical of shoes in this category. If you ask us what we think based on the wear-test, we felt that the 2012-13 SG4/5 sat a little higher, but that assumption could very well be because of the Formotion foot-pad. 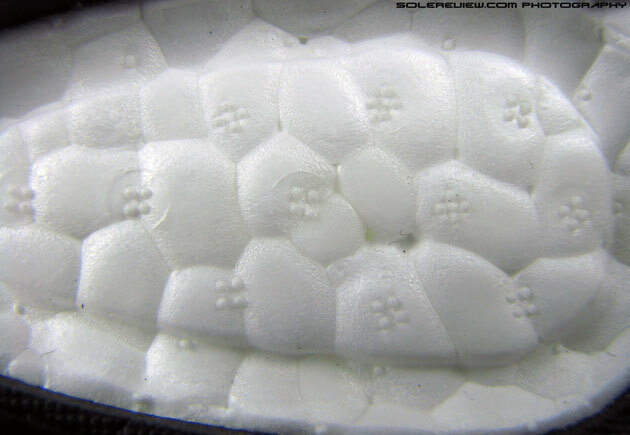 Outsole has generous coverage of rubber. 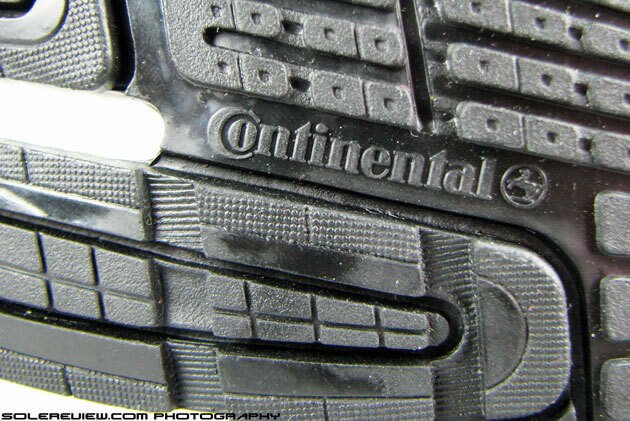 Outsole rubber is developed in association with Continental, the German tyre maker. Grips pretty well. 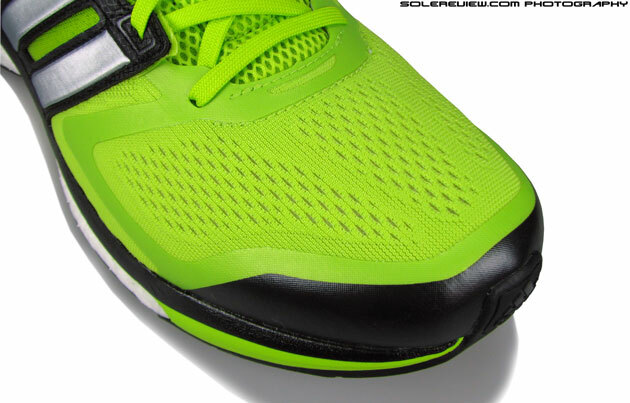 The outsole design is flatter, with less exposed areas – a functional trend which kickstarted with the 2013 Energy Boost. Compared to past Supernova Glides, there is more rubber coverage in the forefoot, bolstering grip and durability. A notable mention is that the SG6 comes shod with Continental (yes, the tyre company) branded rubber, which is meant for better grip. Last year’s Supernova Glide 5 and Sequence 6 had it, and do does the Takumisen racing flat. Plastic Torsion ‘fingers’ keep the shoe from twisting sideways. 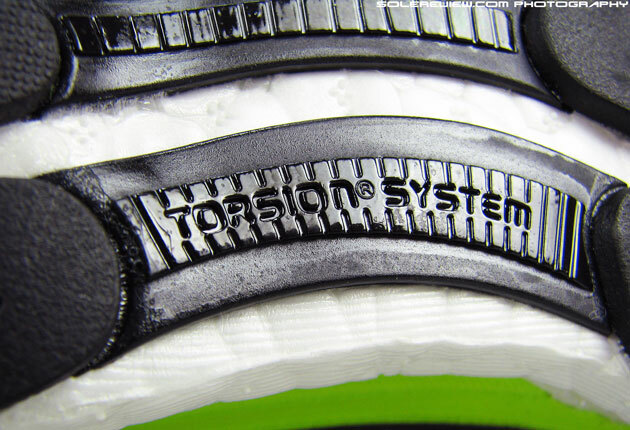 A four-banded plastic Torsion plate joins the rear and front outsole pieces, but its use is restricted to just underneath the midfoot. It does not extend forward like in the Energy Boost, nor towards the rear-foot. The forefoot mesh design has an uncanny resemblance to Nike Lunarglide 5. Tongue is gusseted to the sides, resulting in good fit and feel. Air mesh topped tongue is padded, but lacing pressure makes itself felt through. The upper is such a contrast to previous Supernova Glides, it makes us wonder whether a comparison is even worth pursuing. Past versions of the Glides were unpretentiously plush, but the SG6 refuses to dwell in the past – it just wipes the slate clean and starts over afresh. The mesh is no longer an expensive looking spacer variety. In its place is an engineered mesh in the forefoot, the design of which looks suspiciously similar to Nike Lunarglide 5. It is breathable, yes, and comes with some sideway stretch, but it looks and feels very frugal. Bootie/sleeve construction elevates interior fit levels. 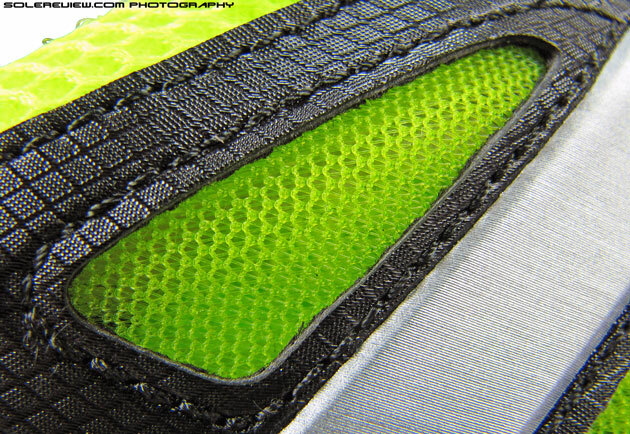 The tongue has a very basic construction, with air-mesh stitched over sandwiched foam and fabric lining. It does not have the unfettered plushness of the older Supernova tongue, but now comes attached to the upper, forming an inner sleeve – which is a good thing. If there’s any drawback of the leaner tongue, it is an increased sensation of lacing pressure. The latter is also caused by a wider gap between the eyelets as compared to the older construction. Greater the lacing length over the foot-top, greater the top-down pressure generated at the intersection where laces cross over. Midfoot design is now simplified. Molded 3-stripes on a textured piece of synthetic leather, with vertical gaps between them. Open ‘net’ mesh between midfoot panel gaps. Mid-foot area sees a lot of clean-up. 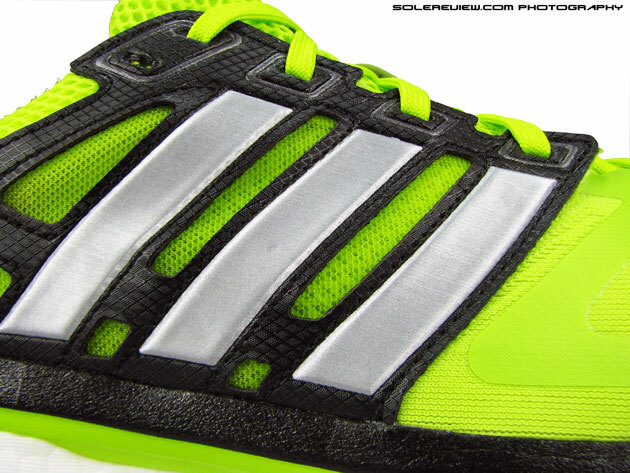 Panels are molded in the shape of Adidas 3-stripes, and form part of the lacing system at the top. Ventilation is good too – the panels are separated by gaps lined with open mesh underlays which let air in with ease. There’s room upfront ahead of the toes, so can’t label the SG6 as true to size. But this gap is small, more 1/3rd than half size, so would recommend trying them on before buying. Overlay treatment is a familiar sight, example of which was last seen in the 2013 Supernova Glide 5. The toe bumper is layered with a thick film of urethane, and other fused bands run along the forefoot side, aligning with the design language used in other Boost shoes. There’s massive cutback on use of thick, traditional synthetic in the mid foot and heel, replacing that with a thinner material. Reflectivity is only on the heel. 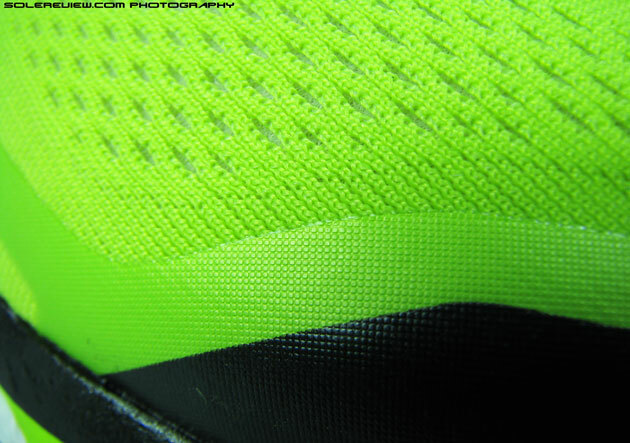 The SG6 does not have a micoach foot-pod cavity, so why the callout? The tongue is gusseted, so lace loop is only a mere decoration. Night time visibility is dialed down on the 2014 SG6, limiting reflectivity to a triangular area on the heel. Till last year, the tongue lace loop used to be reflective, but not anymore. This year the SG6 has a gusseted tongue so the lace loop is more decoration than function. 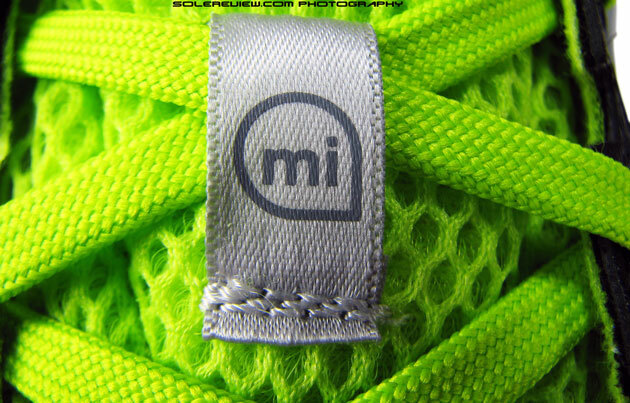 And so is the ‘Mi’ call-out on the lace loop, short for MiCoach. 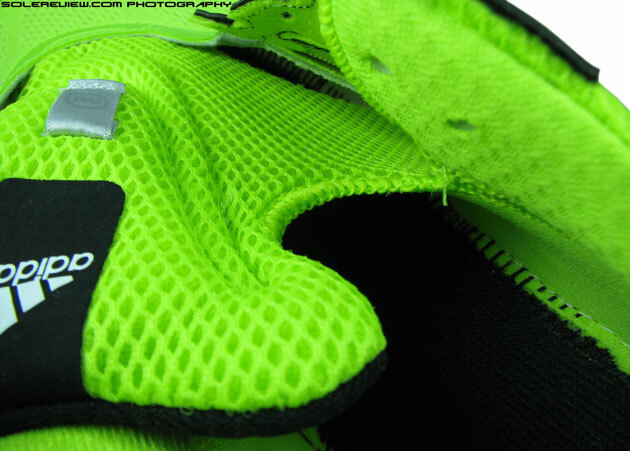 There isn’t a MiCoach pocket, so not sure what the point of having the logo there is. MiCoach, like Nikeplus now comes digitally integrated into smartphones, making the choice of footwear irrelevant. To sum up, the Supernova Glide 6 Boost is a capable shoe, delivering performance in a no-nonsense manner. It’s got plenty of cushioning which comes across as soft and responsive, yet throws in an element of firmness by means of a traditional EVA foam liner. The upper’s quite breezy, the fit is snug and comfortable and the Continental rubber clad outsole grips tenaciously. The SG6 is capable of taking on most running routines – be it fast, short distances or marathons. At 326 gms or 11.5 ounces, it is lightweight for a shoe in this category. Now you see what we’re getting at. It is important for Adidas to make sure that each Boost shoe makes a compelling case for itself, by having a clear differentiation and tiering strategy. Otherwise, sooner or later going to be a problem selling more expensive versions of the Boost. Adidas has a good thing going with the Boost, and it would augur well for them to tread wisely. After all, it is not everyday that one conjures up materials like steam-molded expanded Thermoplastic Urethane foam. I buyed them for training (60 miles/week) but they were too firm in the heel to the point were it was impossibile to take a long run in them. To me the reason of this firmness is the cardboard strobel board that’s basically like a layer of hardwood under your feet, maybe if it was made of EVA like the majority of running shoes it wuold have result in a better sensation. Hi Francesco, do you think you can upload a picture of the cardboard strobel here? Our shoe did not come with that layer. There is a fabric strobel and a firm layer of EVA beneath that. What is your average running speed and weight, if you don’t mind our asking? Unfurtunately I’ve returned them to the store, but it’s the same design of yours in the pictures. It seemed to me cardboard, likk the one used on some Nike because the flm fabric is very thight and firm. In fact if you knock on it it will sound like knocking of wood and this explain why the forefoot seems more cushioned than the rearfoot beacuse in the forefoot the boost is all up to the entire midsole. I’m 65 kg and my running pace is around 4’/km. As for the drop from asking directly to Adidas, it is 10 mm. Thanks for the information, this helps! Yes, the forefoot is much more cushioned than the rear – the under heel is firm EVA, which when knocked, results in the sound you described. Since you reviewed either the Energy, the Sonic and the Glide. Wich among there three has the more cushioned feel? Energy Boost 2 has more cushioning than the other two. Yes, feature differentiation is key to continued success of the Boost line. Right now they’re just carpet bombing the market with Boost models, that might not go down well in long term. Yes, try the Boost on, they feel different from traditional foam based shoes! Thanks for the thorough review. Was looking into getting a long distance shoe and the SG seems like it could fit the bill. Not sure about getting the SG5 at a discount or the new SG6 though. I’m a midfoot striker and based on what I’d read it seemed the boost didn’t really much in that case but after reading your review and the above comment I’m not so sure now! PS – can’t seem to find an RSS feed, is that something you could add? Thanks! You mean the Adios as a long distance racing shoe as opposed to the SG6 an “easy running” shoe because overall the cushioning should be better on the SG6? Actually, cushioning is not that different between the two. The Adios breathes better and is lighter than Glide so it has an advantage when it comes to combining distance with lightweight comfort. And you get the ‘touch-and-go’ feel of a racing flat, which is good for building tempo. But this is only our view – give them a try on and let us know what you think! Interesting, thanks, will you be reviewing the Adios Boost too? Yes. But we have to prioritise our reviews and our calendar is booked solid till August. Maybe end of next month or later. Glad to hear about your running post-recovery! The Adios’ slimmer forefoot and tight upper appeals to us for faster road runs, including track intervals. The super snug upper keeps blisters at bay too. What’s your personal experience with distance flats? Sorry, had found some “cheap” Adios Boost v1 and wanted to try them out before posting again 😉 Probably best to post my thoughts in the Adios Boos v2 review though. As to your question about distance flats, I guess the Adidas Tempo could count towards that with their 260g in 11.5 and I quite liked them, more so than the Boston 4 (302/12) I’m sending back but I couldn’t find them in 12 which turns out to be my Adidas size really. The very light Skechers GoMeb v2 (224/12) would meet the requirement even more but I find the upper too “plasticky/stiff” (even worse than the Adios Boost v1) but they’re quite hard and narrow (blisters on the side…). Thanks for your feedback on the Tempo! The problem with Boost that it just makes their plain Adiprene feel so yesterday. So the way things are headed, it seems a distinct possibility. one thing I noticed about the non-Boost Adios 2 is that they are absolutely lovely and comfy when completely soaking wet (!!!) in the pooring rain :-). In view of your upcoming Adios Boost 2 review there are a couple of things that would interest me. The material of the cloth of the non-Boost Adios 2 feels a little too hardish / ‘scrapy’ when walking / running in them barefoot. Apart from that, the little arch support for the inside part of the foot (in my opinion) is a bit too far to the front. This means that when they are dry I have to watch out for a potential blister just behind of the inside ball of the foot (from scraping back and forth on the dry – and rougher – insole). However, I have noticed this effect to be considerably less pronounced when they are soaking wet (as e.g. in the pouring rain or after having put them under the tap) and therefore much smoother. Out of all the running shoes I have, the Adios 2 definitely are the ones where I feel most like wanting to run in them. They are just so incredibly light – and despite of how delicate they may appear, remarkably well-cushioned. Apart from that, I have noticed over the years that the material of the inside of running shoes (particularly collar and lining) could be a lot smoother and with less friction – particularly when running barefoot and having your skin scrape back and forth. That is something I still find a bit weird and I would prefer if comfort were put above the looks of a certain type of cloth. Anyway, am very much looking forward to your review. Actually the upper material of the non-Boost Adios 2 and Boost Adios 2 are very similar, so the fabric is indeed rough as you have pointed out – it is not comfortable running in them barefoot. And yes, we have also observed a problem with the arch-area in the Boost Adios 2 – we will highlight that in our review later this week. Though the nature of the problem is different from the non-Boost Adios 2. Agree that the lining material could be much smoother! I did another 5km in them and this time there were no problems with blisters as described above. However, one thing I did do before setting off was to take out the footbed and remove all of the little ‘threadballs’ that develop over time in order to get the surface reasonably smooth again. I believe it may have helped (at least it did not do any harm…). Anyway, they could be a little bit less scratchy but I still love them barefoot. It would be nice if Adidas could bring out a kind of ‘Hoka-ised’ version of them – the light weight plus 3cm of cushioning foam (Boost or not) underneath. At least my hips would be very gratefull and it would spare me the week I currently have to wait till I can go for another little running outing. As far as further reviews are concerned, I would like to suggest the Hoka Clifton, the Hoka Mafate Speed, and the Altra Olympus :-). Anyway, carry on with the good job. Thank you for sharing the feedback. And as far as Cliftons are concerned, a review will be up soon. The soft padding around the ankle thins out too early (if you look from the heel). In the Glide 5, it went all the way up to the shoelaces. And even in that case there was considerable room for improvement regarding padding! On top of that, just like with the Supernova Sequence 6, the tongue is too thin, too short, and too small horizontally (which means that in the case of the Sequence 6 virtually naked plastic digs into your skin !!! (particularly the upper shoelaces section !!!) – alright, the effect is far less noticeable in the Glide Boost but it nevertheless is there and it nevertheless is as senseless as it is unnecessary !!!). I would have much preferred had the tongue in the Glide Boost been like that in the Adistar from last year (pre-Boost) where it was as thick, wide, and long as anything and more like resembled classic big Adidas football/soccer shoes tongues !!! Othewise continue the good work and all the best. Hi! Thank you for the very detailed and insightful comment, gives us and other readers a really good perspective. Yes, completely agree on the ‘thinning’ out of areas such as collar and tongue. We called it out as such in our review, and also commented whether it made sense to compare the Glide 6 Boost with non-Boost versions – as they are so different! Thanks for the reply :-). I hope that the lads and lasses at Adidas do actually read and learn from reviews like yours and critical posting (although I have my doubts). Weather permitting will take the Glide Boost through their walking about in them barefoot paces (up and down our local (green) slag heap) this weekend and see what happens thing out and blister-wise :-). Should it not go well, I will pay a visit to a local DIY store (as I said, I was not kidding ;-)). Anyway, thanks again for your marvellous efforts. It will be interesting to see your DIY, it will be great if you can post the image here once done! As I said/wrote I was not kidding when I said/wrote that I would be paying a visit to my local DIY ;-). I have since been able to run a bit (5-6km) in them and I was pleased to see that the thinning out at the front of the collar did not make things as uncomfortable as I had feared (walking about in them is just about o.k.-ish though). What in the end still earned me another blister probably was the new Supernova Glide 5/6 shoelace geometry. And this is where my little bit of home surgery comes in. I went to a local DIY and got myself adhesive sponge rubber (15mm wide and 10mm thick). Just like with the Sequence 6 the lining and collar of the Glide 6 is open at the front. This means that all you have to do is cut the sponge rubber stuff to size and squash it under the collar so that it fits (I used two each, directly next to another on both sides of both shoes). Should you prefer to use any of or both upper shoelace holes, all you need to do is punch through the sponge rubber with the shoelace. I prefer not to but then of course every foot is different. Unfortunately, I cannot provide you with a photo as I do not have any camera. However, take your Glide 6 test sample and imagine the whole collar having about the same thickness from the back to the front. Once my foot is fine again, I will also take them, now in their ‘modded’ state, through their running paces to see what happens. Walking about already feels lovely (virtually old-schoolish 😉 and reasonably plush. Anyway, carry on the good work. Regarding bounciness. Which shoes would you recommend. Regarding the Adidas Cairo, I really mean shoes that almost give you the impression that you are running on the Moon :-). I forgot one little thing. I have the impression that in the case of Adidas you are best of with shoes manufactured in China. My Sequence 6 were manufactured in Vietnam and the difference in quality to my other Adidas shoes is quite remarkable. How do things in this respect look as far as other brands are concerned? a) How old is the factory? If they have enough experience and keep investing in new manufacturing technologies, they tend to churn out better product. b) Is the brand paying enough attention to the factory? Which means, enough people to monitor the management and also train the workers with best practices. c) Where is the factory located? Is it in a place where other similar factories and industries are also present? Then they have the pool of worker talent and raw material suppliers to enable them to make good quality products. d) Higher the volume of products made, higher the productivity and hence quality. China checks most of these points, so the quality is usually better there. So they end up making higher end/technical products too. 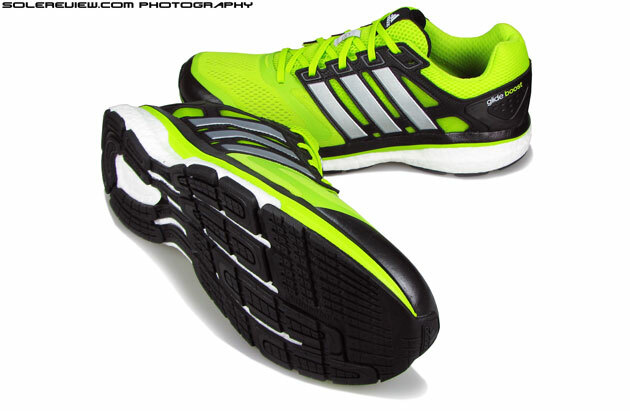 However, we do love how the Adidas Energy Boost rides and even the Pegasus, though it is little soft. What kind of socks do you wear? We ask because we did not feel the eyelet scuffing you’ve experienced on the Glide 6. Speaking of Boost cushioning, we’re planning to review the Pure Boost, which has more of the new foam in its midsole. Should be really cushy and bouncy too! Energy Glide Boost or Energy Boost-which is better? Hi. I came across this website a few weeks ago while doing research for a new pair of shoes and I thought your reviews were excellent – very detailed, informative and unbiased so I will be a regular here from now. So here’s the dilemma and going the posts I know you’ve heard this one 1000 times. I’m currently running in Vomero 5’s (why why did they ever change the formula) and I have to replace them soon hard as it may be. I bought the Vomero 8 and just could never get into them so they were consigned to leisure wear but the 5’s for me had the perfect plushness, cushioning and durability. I’m an intermediate level runner, neutral and doing a 7 to 7.30 / mile pace running 6 to 12 miles per run. I had some knee pain (inner right knee) which went away after I started using the Vomero (who knew what a difference the right shoes could make)? So I’ve been considering the SG6, Pegasus 31, lunar glide 6 (not really neutral I realize), Saucony Ride 7 and Brooks Glycerin 12. Which of these do you think come closest given what you know of my running? Also I’ve read about more speed oriented shoes. Do they make that much of a difference? I’d rather have the cushioning but I am trying to build speed so is there a way in real terms to say how much of a difference they make e.g. Take 10 seconds off my mile pace or is it just a matter of “feel”. Thanks in advance for your help and look forward to reading more great reviews! Hi, thanks for visiting solereview! The Vomero 5 ride is hard to top, but out of the options you’ve mentioned, the Pegasus 31 and Saucony Ride would be the closest. Pegasus a little soft, Saucony a bit more balanced. If by speed oriented shoes, you mean racing flats, then yes, they do make a difference – both in actual running economy and feel. These type of shoes come with a slim forefoot and a super snug fit which allows quick ‘touch and go’ necessary for building speed. Great – thanks for the reply. Yes (excuse my terminology) I was referring to a racing flat. Is there a shoe that has hybrid qualities? Meaning, on that has both elements of speed and comfort ? Otherwise you could consider the Zoom Elite 7 or the Zoom Streak 5, both Nikes. Happy to hear that our reviews are fun! By the way, we have news about the 2015 (or late 2014?) Vomero 10, just scroll down to the bottom of our Vomero 9 review. The new Vomero looks way better. Thanks for the details, it is a great example of customization, and happy to hear that it works out for you. We’re due to review the Supernova Sequence 7 later this month, and will check how the collar area compares against the Glide 6. 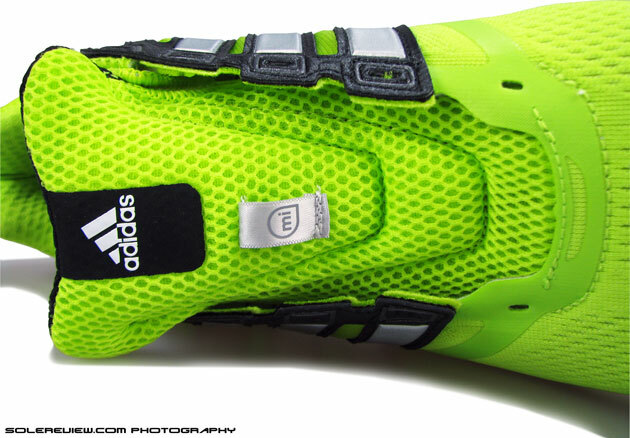 We will also review the Response Boost, which seems well padded in the collar. Hello! May I know the difference between this and the Energy Boost 2 and which one is much better overall? To sum up in one sentence, the Glide 6 upper has a relaxed fit, and midsole slightly less padded than the more expensive Energy Boost. Between the Super Nova Glide 6 and free 4.0 flyknits which one would you prefer/ a better shoe? Both are very different shoes. What are you looking for in a shoe? maybe the adizero cadence 2.0 spikes will do great? maybe the flynit 4.0’s will do even better? hard to say… im just looking for a shoe thats perfect for running hills and flat areas, gives me decent comfort w/ out making my feet ache so much so fast and making my feet feel “free”…. your the expert what do you think :P? Sorry for the very delayed response! How about the Nike Zoom Streak LT 2? Great shoe for XC training. Have since gone back to modding my Supernova Glide Boost – although with a difference. If you take a closer look at the Supernova Glide 5 you will see that the lining also is open if you look at it from the front. I have since gone back to using the top shoelace holes – although with a difference. I only put the shoelaces through the outer stuff and not through the collar / lining as well (!!!). 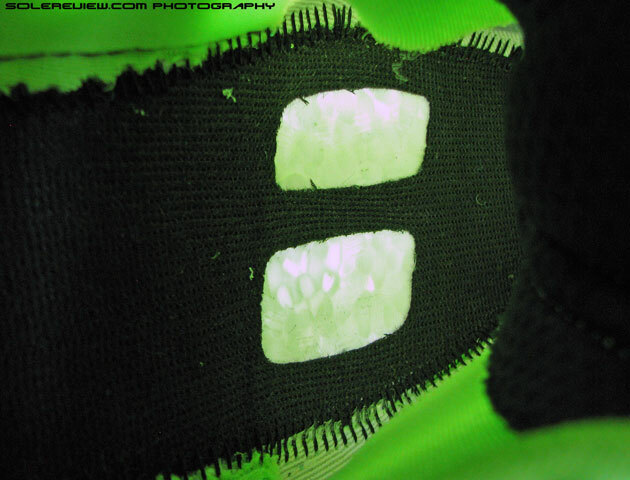 After that, I had extended the padding of the collar right up to and beyond the top two shoelace holes. Voila! The return of plush (apart from the fact that the collar of the Glide Boost on the whole is thinner than that of the Glide 5). If you look at them from above, you will see a similar witdh of the collar from the heel all the way to the shoelace holes! (at least with my Supernova Glide Boost). And they now feel really comfy and plush! Another thing I did was to take a sharp pair of scissors and cut the insole / footbed to size – no more blisters! Adidas really did exaggerate and make the insole / footbed too narrow (at least for my heels). I cut off around one centimetre and now the insole / footbet of my pair (size US 13) only has a height of around 5 mm, i.e. it is virtually flat. By the way, I have since got myself a pair of Hoka One One Cliftons and in part I am very impressed – unlike Adidas they have managed to solve the problem of thinning down the tongue – by moving the tongue cut-out for the shoelaces further upwards so that the shoelace knot is in the area of / on said cut out and does not dig into your foot! Apart from that, the tongue also is wider. Although it does remind me of my first pair of ‘properly’ branded trainers in the 1980s (Puma Blue Star), Hoka’s solution is simple and it works. I do look forward to further models from Hoka One One :-). Post a picture whenever you can, would be fun to see! Yes, agree with your thoughts on Clifton’s tongue. In addition to the design, the tip material at is quite soft too. Having done some running in my Supernova Glide Boost I do concur with your assessment that they are rather odd. For a start, the forefoot part is far too hard in my opinion. On the other hand, once Adidas really understands how to use the Boost stuff properly, they will probably blow the likes of Hoka One One and Altra out of the water! After all, Eva is Eva is Eva!!! Boost quite simply is far better! (After only 3 weeks (!!! ), my Adios 2 EVA (non-Boost) were rock hard and I have since retired them as running shoes – after all, I still need my hips ;-).) I remember a similar effect from my Adidas Cairo – after only a couple of weeks the bounciness quite simply was gone. Hi – it will take time for adidas to learn how to maximize Boost’s potential. Right now they are carpet bombing the market with many models and differentiation/authenticity is an obvious casualty. so what is the best neutral cushioned shoe? I currently am rotating between Pegasus 29, Saucony triumph 9, and Brooks ghost 6. I tried on the supernova glide boost 6 and was ready to pull the trigger but didn’t want to till I read some reviews, now I’m unsure. the holy grail I compare shoes to is my old, retired pair of Zoom Voomero 3 and I’m looking for the next closest thing in terms of cushioning and neutrality in a well made shoe. of the three shoes I’m currently using I feel like the Pegasus is the most easy going but not very structured, the Saucony is a bit narrow and the upper overlying the big toe is wearing thin, and the ghost is not as soft as I thought it would be in the forefoot. what do you suggest?? How about the new Saucony Ride 7? The Vomero 3 is a hard shoe to match, but Ride 7 shines with all round competence. The other alternative would be the Asics Gel Nimbus 15 (yes, last year’s model, not the 16), if you can live with the chunky profile and extra weight. I will definitely check out the ride 7. I have a pair of Gel nimbus 12’s and never got comfortable in them. seemed too hard. are the 15’s softer or better? Let us know how what your first impression of the Ride 7 is. Yes, the Nimbus see-saws all the time. The Nimbus 14 was hard, 15 was the softest ever, then this year’s 16 firms up again. Not very different indeed, and someone else was asking about it too. Here’s what our reply was! i’m wearing a pair of these with about 450 miles and there are a lot of claims out there about the durability of the boost material. I’m curious your opinion. Are they only good for the standard 500 miles or can we expect them to go 700 – 1000? bought these once the 7’s came out, so was able to get a good deal. also bought the Nike Pegasus 31’s at the same time. Thought I’d use these for different types of runs. Problem is that the Supernovas completely blow the Nikes out of the water. As a forefoot striker, I find the adidas to be among the most comfortable shoes I’ve ever worn to run. The Pegasus are ok, but the Supernovas are in a different stratosphere in terms of cushioning. I’m sure I’ll find a use for the Pegasus. They certainly look better than the bland Supernovas, but I’m inclined to buy about 2 more pair of the Supernovas so I don’t run out. Appreciate the insight – the Boost foam is something. 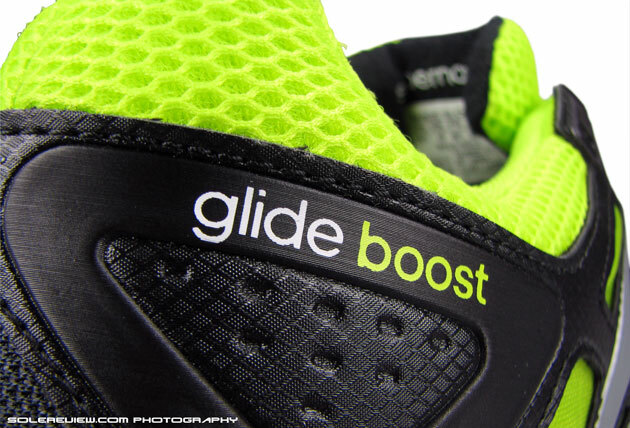 We also feel the Glide Boost to the most balanced Boost of the lot, as far as upper fit, stability, price, and quality of ride is concerned. Do you have any idea how the ATR version performs, especially in summer? The main use will be for walking, as the person who wants to get the shoe has knee issues and needs something with good cushioning. We have tried the regular version and it fits like a glove and relieves her knees, but the ATR is more affordable and better looking (the colors are not as… stunning). Being water resistant is nice too, it rains a lot here. I’m just worried the shoe will get too warm when it’s 30°C outside. Also, any differences between men’s and women’s version? If they are identical, men seem to get nicer color options. Can’t say from personal experience since we haven’t reviewed ATR versions. But as far as water resistant uppers go, some assumptions can be made. Such uppers usually run warmer than regular meshes. But at the same time, as the person you describe won’t be running in them, there won’t be the same level of heat inside with just walking around. Also to be noted is the fact that most proper walking shoes feature leather uppers, so don’t imagine the ATR version will be any more or less hotter. For most shoe models, there is no difference between men’s and women’s version, just sizing and color differences. something expensive and miss out on something cheaper that can fulfil the need. Hi, the Glide 6 Boost and Asics Cumulus 16 (also try the Nimbus 16) seem to fit your needs based on what you’ve described. So now a year and half later, Glide 6 boost really lived up to my expectation and your review. 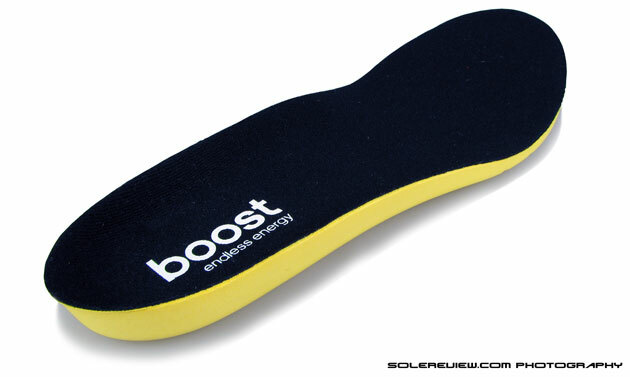 However, now that I’m highly addicted to the stock insoles, I want these Glide insoles in everything! So this really isn’t a shoe question to you but what’s the closest insoles you know of that feels like the standard stock insoles of Glide 6? Do you mean like aftermarket insoles matching the feel of Glide ones? We have no clue! Adidas. I’m a bargain hunter, but sometimes expensive items are expensive for a reason. I’ve run in the Nike Air Pegasus for a couple of years now. When it came time to replace my 29s, I thought I’d lucked out by finding a pair of Nike Air Peg 31s on ebay for $65. Running in them feels no different than in the 29s – they’re good workhorse, long distance/recovery day shoes for me. However, three days after my eBay find, I located a pair of the Supernova Glide Boost 6 on clearance for $30. Buying them defeated the purpose of my big savings on the Nikes, but it seemed too good a deal to pass up, and I figured it couldn’t hurt to have another pair of good daily trainers. However, to my surprise, when the Supernovas arrived I discovered the same thing @throwback down below said. The difference between the Glide 6 is vastly superior to me. The Pegasus is cushioned enough to save my totally flat feet from taking a pounding, but on days where I feel sluggish, the shoes feel sluggish with me. This is where the Glide 6 shines: on good days they feel great, but when I’m tired they put some pep in my step. It’s a sheer pleasure to run in them. I guess I shouldn’t be so surprised since the Adidas Adizero Adios Boost, which I break out on race days, are the favorites in my line up. But I’m not just surprised, I’m shocked. The Pegasus feels like an economy car, while the Glide 6 is pure luxury. Coming soon to Ebay: a twice-worn pair of women’s size 10 Air Pegasus 31 for $50. And though I was ecstatic to pay $30, I believe I would pay full price to replace my new Glides. They’re that good. The Glide Boost is indeed excellent. Whenever we get a question/comment about which all-around neutral to buy, we point them towards the Glide – more so than the Pegasus. Thank you for sharing your feedback! Hi,Would you recommend these shoes to someone with high arches and plantar fasciitis?Softness is also very important for me.By the way, I won’t run in thse shoes.I want to buy them for everyday walking. Sorry but another thing.Is it wide enough.I bought nimbus 15 and i had to change them as they were too narrow. The Glide 6 is an excellent shoe which combines cushioning and support very well, so unless you have special needs with regards to PF, it should be fine. It is also firm in the midfoot and heel, with flexing happening in the correct place – forefoot. That said, the fit in the front is narrow, so you might have to strike this off your list. Instead, we would recommend the new Vomero 10. Not mushy soft, but cushioned enough and a very spacious forefoot. I bought the shoes before seeing your answer. I liked the shoe except the narrow front.It disturbs a bit but I guess I will get used to it. I am not an expert but the feel of the shoe is quite like the nimbus 15. Thank you for the answer. I will think about vomero 10 for my next purchase.